Choosing between hitting the bar or sweating up a storm on the barre is a thing of the past thanks to nightclub-esque workout classes, the latest fitness trend that is quickly becoming the healthier way to get lit. As we all become increasingly health conscious (go on, admit it, you’re trying just a little bit harder these days), there are plenty of people who have already begun swapping out happy hour for an after-work fitness session, but now an influx of nightclub inspired fitness studios are not only removing that decision, but also making your gym class infinitely more fun. Replicating the atmosphere and buzz of a night out on the town with your mates, nightclub style fitness studios are jacking up the best aspects of hitting the club while adding in some serious sweat. Here, you’re high on endorphins and shotting back kombucha and trust us, it ain’t at all bad! 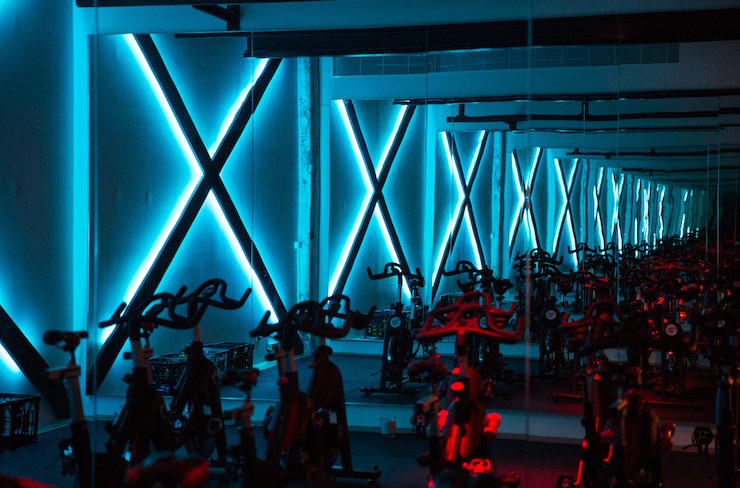 From high-intensity intervals sessions in red-lit rooms to spin classes filled with synchronised bodies pedalling to the beat, this new breed of studio is bringing in sound and light systems that rival the top super-clubs purely for your immersive “experience”. And the best part? You’ll be led by a feisty instructor whose very job it is to hype you up—just like your ultimate wingman, but this time, for sweat. Then there’s the emergence of “wellness clubbing”, the kind where yoga studios take over actual nightclub spaces for mindful movement workshops, or ecstatic dance parties, which kick off before sunrise filled with revellers adorned in glo-mesh and glitter, sober raving as the world awakens. The after party serving up fresh-pressed juices and bliss balls, of course. The trend appears popular with corporate teams looking to incorporate wellness incentives or active networking events, but is an equally perfect, if not slightly pervy, way to pick up a date or new friend. Because unlike trying to make eyes at someone across a bar, here at least you’ve already got one common interest—getting fit. Want to give it a whirl? Check these spots out. If you prefer your fitness trends outdoors, check out what plogging is all about.